Fundamentally redesigned and re-engineered. The largest Apple Watch display yet. Built-in electrical heart sensor. Automatic workout detection. Fall detection and Emergency SOS. Built-in cellular1 lets you use Walkie-Talkie, make phone calls, and send messages. Stream Apple Music2 and Apple Podcasts. And use Siri in all-new ways—even while you’re away from your phone. Want the same great features with a smaller watch face? Check out the Apple Watch Series 4 - 40mm. Time to save! You qualify for up to $60 off when you buy Apple Watch Series 4. See Offer Details! Take calls, send texts, listen to voicemail — Apple Watch Series 4 with cellular keeps you connected no matter where you go. ECG on your wrist. Low and high heart rate notifications. Fall detection and Emergency SOS. Digital Crown provides an easy navigation without obstructing the display. Haptic feedback delivers a click-like feel. $60 CREDIT OFFER: Subject to change. Must purchase eligible device/have eligible devices and activate with eligible service. 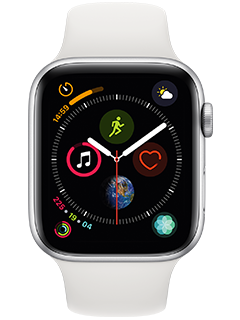 Eligible Devices: Requires (i) Apple Watch Series 4 GPS + Cellular purchase at full price, on installment agreement, or bring your own (excludes ones purchased on 2-year agreement) and (ii) HD-voice activated iPhone 6 or newer. Eligible Service: Both Apple Watch Series 4 and smartphone must be on same account with postpaid wireless voice & data services. (i) Apple Watch Series 4 requires min. $10/mo. when added to eligible shared plan;(ii) Smartphone requires min. $50/mo. for new svc with autopay and paperless bill discounts. Pay $60/mo. until discounts start w/in 2 bills. Bill Credit: Account and service on your line must remain active to get up to two credits ($30 service + Up to $30 activation) w/in 3 bills. No activation credit if already waived. Offer Limits: Max. of 1 activation credit/waiver per device. One credit offer per eligible Apple Watch Series 4 activation. May not be combinable with other offers, discounts, or credits. Purchase limits as low as 2 apply. Other restrictions apply. Device Limits: Apple Watch Series 4 requires AT&T NumberSync to access the AT&T cellular network. For SMS/MMS messaging, the synced iPhone must be on and connected to the AT&T network (via cellular or Wi-Fi connection; if using Wi-Fi connection, smartphone must have Wi-Fi calling activated). iMessage must be enabled on your iPhone. See www.att.com/numbersync for details. Usage charges apply. GEN. WIRELESS SVC: Subj. to Wireless Customer Agmt (att.com/wca). Svcs are not for resale. Deposit: may apply. Limits: Purch. limits apply (as low as 2). Prices may vary by location. Credit approval, taxes, fees, monthly, other charges, usage, speed, coverage & other restrs apply. See att.com/additionalcharges for details on fees & charges. Promotions, terms & restr’s subject to change & may be modified or terminated at any time without notice. International and domestic off-net data may be at 2G speeds. AT&T service is subject to AT&T network management policies. See att.com/broadbandinfo for details. Pricing, promotion, terms, & restr’s subject to change & may be modified or terminated at any time without notice.